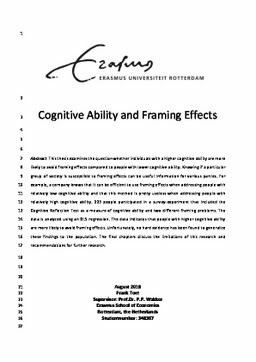 This thesis examines the question whether individuals with a higher cognitive ability are more likely to avoid framing effects compared to people with lower cognitive ability. Knowing if a particular group of society is susceptible to framing effects can be useful information for various parties. For example, a company knows that it can be efficient to use framing effects when addressing people with relatively low cognitive ability and that this method is pretty useless when addressing people with relatively high cognitive ability. 223 people participated in a survey-experiment that included the Cognitive Reflection Test as a measure of cognitive ability and two different framing problems. The data is analyzed using an OLS regression. The data indicates that people with higher cognitive ability are more likely to avoid framing effects. Unfortunately, no hard evidence has been found to generalize these findings to the population. The final chapters discuss the limitations of this research and recommendations for further research.